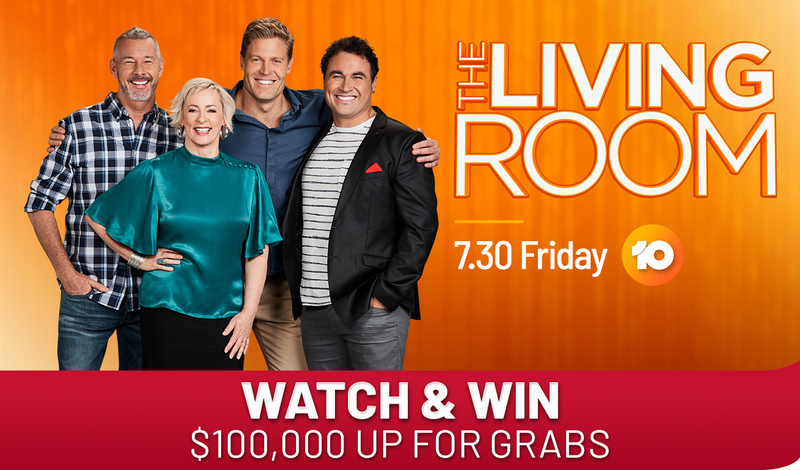 The Living Room | Shop A Docket - Watch & Win 2 x $10,000! This month THE LIVING ROOM is giving away $10,000 to TWO lucky winners! Imagine what you could do with a fist full of cash? Thanks to our friends at Shop A Docket you could be a winner. WATCH 10 or 10play and you could WIN. STEP 1: Watch The Living Room 7.30 Fridays on TEN. STEP 2: Look for the CODE WORD. STEP 3: You choose how to enter. ONLINE - Sign In / Sign Up to tenplay and complete the entry form. FREE ENTRY, limit one entry per day. SMS - TEXT the CODE WORD, your NAME and EMAIL to 1999 1111 (Entry Charge $0.55) Ansible Pty Ltd Helpline 1300 851 419. UNLIMITED ENTRIES - CALL 1902 555 0111 $0.55 fixed (mobile calls to 1902 extra). Competition Total Prize Value: $100,000.00. November Prize Value: $20,000. November Phase 5 Opens: 2/10/18 at 19:30 AEST. Closes: 25/11/18 at 23:59 AEST. Draw Date: 26/11/18 at 11:00 AEST. Win a $5,000 Qantas voucher! Win a Mercedes-AMG GLC63 S! City or Beachside? Win a $1.69M Home! Win a $3.3 Million Property Portfolio!